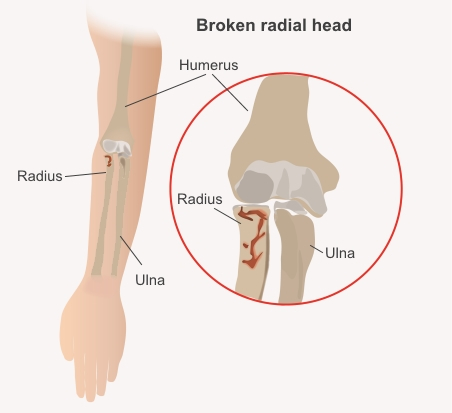 What is a broken radial head? The radial head is the top of your radius, one of the two bones in your forearm. A broken radial head (radial head fracture) means you have broken this bone just below your elbow – some doctors may call it a broken elbow. Occasionally people break their radial head and dislocate their elbow at the same time. How does a radial head break? A broken radial head usually happens from falling on to an outstretched hand. Serious accidents, such as car accidents, motorcycle accidents, or falls from a ladder cause more serious breaks. Weak bones (for example, in someone with osteoporosis) tend to break more easily. Your radial head can break in many different ways, and some breaks are worse than others. How bad a break is depends on how many pieces a bone breaks into, whether they are stable or move around a lot, and whether the broken ends of the bone are still in the right place. How do I know If I have a broken my radial head? If you have broken your radial head, your elbow will be painful and swollen. It may be hard to bend your arm or get it fully straight, and to turn your hand palm up or palm down. Your fingers may tingle or your fingertips may be numb, which might mean your elbow is also dislocated and it is stretching the nerve. If you think you may have broken a bone in your elbow it is important to seek treatment straight away, especially if you have any tingling or numbness, as delays can lead to permanent nerve damage. Your doctor or nurse practitioner will ask about how your injury happened, look at your elbow and arm, and take X-rays to find out which bone is broken and what kind of break it is. Occasionally people will also have a CT scan, which can show a complex break more clearly, or an MRI, to show any soft tissue injury. On the next page: How are radial head fractures treated?